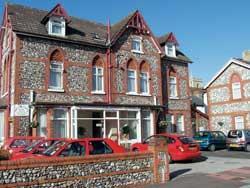 Bella Vista Holiday Guesthouse Guest AccommodationSituated within 100 metres of the seafront, the "Bella Vista" is within easy walking distance of all of Eastbourne's major attractions, theatres & sports venues. The guest house itself is an attractive Victorian flint-faced building and boasts 10 guest rooms in total, 3 of which are on the ground floor, and a brand new family room on the 2nd. With its own private car park and level access to the lounge and dining room, the Bella Vista offers very comfortable '4-Star' guest accommodation for all, including those with mobility difficulties. All rooms are well-appointed with en suite shower and WC, as well as comfortable seating, colour TV, hairdryer and hospitality tray. A superb cooked breakfast is served at 08:30 and a fantastic 4-course evening meal at 6:00pm. * Check-in any time before 9pm (or later by prior arrangement). Bella Vista Holiday Guesthouse limits bookings to 2 or more days. Large ground floor twin en suite with double aspect looking out to the car park and garden. Suitable for wheelchair (large turning area). Space for additional 'fold-out' bed for 3rd (child) occupant. Duvets or blankets/sheets. Two arm chairs. Wardrobe, ensuite shower, tea/coffee, TV, hairdryer, towels provided. ALL rooms are Doubles or Twins. Per person pricing assumes 2 PEOPLE per room. SINGLE OCCUPANTS ADD 50% to normal per-person pricing. (Single occupants will have a spacious Double or Twin-bedded room). Large Ground floor double en suite with side aspect looking out to the patio garden. Duvets or blankets/sheets. Two arm chairs. Wardrobe, ensuite shower, tea/coffee, TV, hairdryer, towels provided. Ground floor Twin en-suite (large bathroom with WC & Shower cubicle). Duvets or blankets/sheets. Two arm chairs. Wardrobe, ensuite shower, tea/coffee, TV, hairdryer, towels provided. King-size Double en suite room with double aspect looking out over the car park and garden. Duvets or blankets/sheets. Two armchairs. Wardrobe, ensuite shower, tea/coffee, tv, hairdryer, towels provided. Room 4 limits bookings to 2 or more days. Situated within 100 metres of the seafront, the "Bella Vista" is within easy walking distance of all of Eastbourne's major attractions, theatres & sports venues. The guest house itself is an attractive Victorian flint-faced building and boasts 10 guest rooms in total, 3 of which are on the ground floor, and a brand new family room on the 2nd. With its own private car park and level access to the lounge and dining room, the Bella Vista offers very comfortable '4-Star' guest accommodation for all, including those with mobility difficulties. All rooms are well-appointed with en suite shower and WC, as well as comfortable seating, colour TV, hairdryer and hospitality tray. A superb cooked breakfast is served at 08:30 and a fantastic 4-course evening meal at 6:00pm. ** Accommodation is offered exclusively for NON-SMOKERS ONLY. Within a 5 minute walk, you will pass the Paviliion Tea Rooms, Redoubt Fortress, Military Museum, Parade Bowls club, Treasure Island, Sovereign Sailing Club and Fishermen's Club. Children welcome from age 5. From the Pier, head north-east on the B2106 (Royal Parade). At the Redoubt Fortress and Military Museum, turn left into Redoubt Road. "Bella Vista" is 100 yards on your left, on the junction with Latimer Road. Pull into any marked bay in our private car park. From the Station, ask a taxi to take you to the "Bella Vista" (about a 5 minute ride) or take any bus from Terminus Road that goes along "Seaside" (the A259). Get off opposite Christ's Church and Redoubt Road is directly opposite the King's Arms pub - "Bella Vista" is 100 yards up on your right. None of our bathrooms have permanently fitted handrails by the WC or in the shower, but temporary/removable facilities may be hired localy and installed in some rooms for the duration of your stay if this is necessary. The use of such removable support facilities is entirely at the risk of the user, and no liability for any damage or injury due to use/misuse or failure of such hired equipment can be accepted by the guesthouse owners.